Whenever I’m at the finishing stages of a project, I will take the time to take a step back and listen to the track as a listener as opposed to listening to the track as a producer. Then I would export the track, get a clean sheet of paper, a pen and listen to the track. At this point I would write down action notes with corresponding times so afterwards I end up having a nice action list describing the changes to apply. 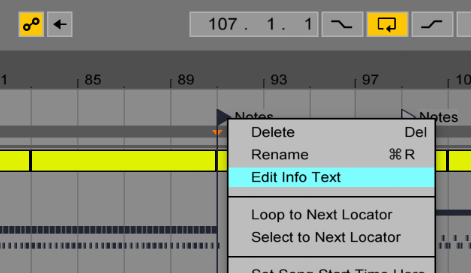 However there is a much more elegant way to do this using Ableton’s timeline locators. While the approach written above is certainly not a bad approach, as you’re moving away from looking at your cluttered project environment, which could actually make you listen differently to your track, I still find that this approach can get rather messy at times. Why? Aside from my bad handwriting (which becomes even worse when writing at full speed to keep up with playing the song), the downfall of this approach really becomes apparent when you start working through your action list and making adjustments like cutting a section or adding a bar, as now the timing of the whole project will shift, leaving the timing you’ve written down on your succeeding action notes incorrect. For example; when you have an action note that says at 30 sec “add hi-hats” this can become 40 sec in case you inserted 10 sec material between these two sections. The solution? 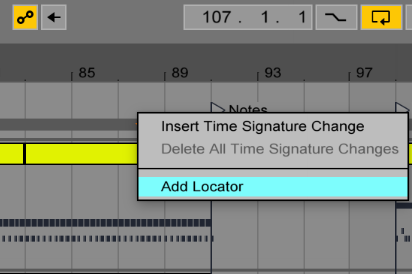 Lose the pen and paper and use Ableton’s built-in time locators!
) Insert a locator by right clicking anywhere in the Scrub area where you want to place an action note and select “Add Locator”. 2.) Name your locator and right click again on the newly created locator to select “Edit Info Text”. 3.) An Info box will appear on the left side of the Device Viewer (the lower part on your screen where all your plugins and audio effects appear) where you can write down all your action notes. Another nice bonus of using locators this way is that you can easily jump to relevant sections of your track which need attention by clicking on the play arrow next to the locator.